If the purpose of strategy is to change an organisation’s trajectory, from one that is taking it to its default future to one that is not only better but achievable, how are the strategic choices best made and how can the chosen strategy best be implemented? In this article, David Trafford and Peter Boggis present a framework for developing strategy that comprises three strategic trajectories: reality, intent and opportunity. They argue that only by understanding the trajectory of strategic opportunity and the trajectory of strategic reality can informed choices be made on the trajectory of strategic intent. 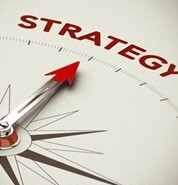 The term strategy is often misused and definitely overused. In his best-selling book, Good Strategy/Bad Strategy, Richard Rumelt argues that the gap between good strategy and the jumble of things people label as ‘strategy’ has grown over recent years and that strategy is not the same as ambition, leadership, vision, planning or understanding the logic of competition. Freek Vermeulen of the London Business School argues in his article So, you think you have a strategy? that at least nine out of ten organisations don’t actually have a genuine strategy. His conclusion is based upon viewing many strategy presentations that lack the basic necessities of cogent and executable strategy, namely that they are not really making choices; are stuck in the status quo; have no relationship to value creation; and are mistaking objectives for strategy. But the reality is that all organisations do have a strategy: it may not have been intentionally and explicitly defined, but the daily decisions and actions that its leaders take are a reflection of that strategy. Most corporate strategies reflect a set of explicit or implicit choices aimed at creating greater shareholder value, increasing market share or, in extreme cases, survival. These choices typically cover market and customer propositions; product and service offerings; organisation and structure; mergers and divestments; and organisational values and beliefs. While all these ‘strategic choices’ are valid and often necessary they, in our view, miss the fundamental purpose of strategy: which is to define the actions needed to change an organisation’s trajectory. By this we mean changing the trajectory that is currently taking the organisation to its default future – which is the place it will end up if no action is taken other than that currently planned – to a future that is not only better, but achievable. If the strategy relates to a part of the organisation, like HR, manufacturing, distribution or IT, the domains of the strategic choices may be different but the purpose is the same: to change the trajectory of the respective part of the organisation. It is also worth remembering that choices are only strategic if, once acted upon are difficult, if not impossible, to reverse or undo. All other choices are essentially planning decisions that can be changed – albeit at a cost. There is nothing new in this thinking as it has always been the role and accountability of leaders to steer their organisations to a better future. The challenge today is doing this in a world where the strategic opportunities are changing at a pace that is often faster than our ability to translate them into action. In our view, the challenge is twofold: firstly, translating what is strategically possible into an explicit strategy, and secondly developing the capability to successfully operationalise the chosen strategy. With the aid of a conceptual framework we will explore these two aspects of developing and operationalising strategy. Our conceptual framework, illustrated in the diagram on the right, comprises the following three trajectories. Trajectory of strategic opportunity – the trajectory your organisation could pursue if it faced no constraints. 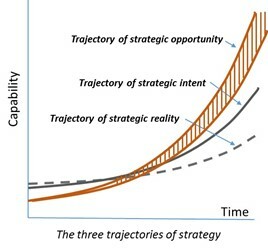 Trajectory of strategic reality – the trajectory your organisation is currently taking. Trajectory of strategic intent – the trajectory your organisation has chosen to take based upon an understanding of the trajectory of strategic reality and trajectory of strategic possibility. It is important to note that the ‘capability’ of each of the three trajectories is increasing over time. This reflects the continuing growth of strategic opportunities, advances in strategic thinking and our increased ability to successfully operationalise strategy. We believe the purpose of strategy is to close the gap between an organisation’s current reality and what is strategically possible. Unfortunately, for many organisations this gap is widening. Let us explore the three trajectories in more detail. The trajectory of strategic opportunity is actually not one trajectory, but an ‘envelope’ of trajectories that represents the direction your organisation could take if it faced no constraints. It is important to remember that the trajectory of strategic opportunity is decided for you, not by you. It is a result of a combination of external factors including the global economy, regulation, regional conflicts, demography, oil and other commodity prices, advances in technology (particularly digital technology) and climate change. The challenge for many organisations is that their trajectory of strategic opportunity is changing at such a pace that it is difficult to track or predict. Long gone are the days when tomorrow’s strategy was an extrapolation of the past. Today the scope of strategic opportunity is creating discontinuities, and so-called disruptor organisations that are redefining business models and industries alike. We call an organisation’s current trajectory its trajectory of strategic reality. We call it this because that is what it is: the reality of the current strategy that is taking an organisation to its default future, which is the place it will end up if no action is taken other than that currently planned. If the purpose of strategy is to change the current trajectory, then it must not only be based upon what is strategically possible, but also on what can be successfully operationalised. By ‘operationalised’ we mean the process by which the choices defined in the chosen strategy become so embedded within the organisation that they become the norm – and the trajectory of strategic reality and trajectory of strategic intent coincide. Complexity – Organisations are becoming increasingly complex – particularly those comprising multiple divisions operating across multiple territories. This is equally the case for governments that comprise multiple agencies led by different ministers. Complexity is a result of the number of components in a system and their degree of interaction. The greater the number of divisions, business units, departments, distribution channels, territories, customer segments, regulators, supplies and partners, the greater the organisational complexity. The results of organisational complexity can manifest themselves in many ways, the most common being slow and inconsistent decision-making, myopic planning, lack of ‘joined-up thinking’, silo management and dysfunctional executive behaviour. People across the organisation can feel frustrated, disillusioned and unable to contribute to their full potential. It is not unusual in these situations to see staff – including senior executives – ‘hunker down’ and pursue their own agenda. Lean – Removal of waste is obviously a good thing, but many organisations have taken this to a level where there is no contingency should anything unplanned arise, nor do they have the capacity to experiment. If an organisation is serious about changing its trajectory, then it needs the headspace to think about what is possible and the capacity to carry it through. Relying on outside consultants to develop a strategy may be attractive from a resourcing perspective, but it does not necessarily develop the level of understanding needed to operationalise the chosen strategy. The application of Lean principles can of course reduce organisational complexity. Organisational Capabilities – Organisations tend to operate and behave in a particular way without necessarily knowing how or why. This is a result of the organisational capabilities they have developed over time. Organisational capabilities are like muscles, the more they are used the stronger they become, and the stronger they become, the more they shape organisational culture and establish organisational habits. Organisational capabilities are formed from a combination of shared mental models and frameworks; established processes and practices; common language, mindsets and beliefs; and shared experiences. Significantly, as they become embedded within an organisation they are not lost when key individuals leave. While competencies are held by individuals, capabilities are held within organisations. In many respects organisational capabilities act like invisible tramlines keeping the organisation on its current trajectory. Changing organisational trajectories therefore requires some organisational capabilities to be introduced, others strengthened and some weakened. The trajectory of strategic intent is the organisation’s chosen strategy. It is the trajectory the organisation has chosen to pursue having taken into consideration what is possible within the trajectory of strategic opportunity and what is realistic in terms of changing the trajectory of strategic reality. A strategy that ignores what is strategically possible ignores the potential of future value. A strategy that ignores current reality has the potential of not being successfully operationalised, and thereby delivering no value. The purpose of strategy is to close the gap by bring the trajectory of strategic reality closer to the trajectory of strategic opportunity. The closer the trajectory of strategic intent is to the trajectory of strategic opportunity, the greater the risk that it will not be successfully implemented – simply because the required change in the trajectory of strategic reality may be too great. Equally, the closer the trajectory of strategic intent is to the trajectory of strategic reality, the greater the risk that the default future will not be changed – simply because the current trajectory will not have changed sufficiently. There are in effect two gaps to close, not one. The first gap – between the trajectory of strategic opportunity and trajectory of strategic intent – is closed by developing the ability to develop strategies that reflect what is strategically possible and strategically realisable. The second gap – between the trajectory of strategic intent and trajectory of strategic reality – is closed by developing the ability to operationalise strategies. Both of these are organisational capabilities that can be developed. Below we offer a five-step approach to closing the two strategy gaps and developing the organisational capabilities needed to do so. The approach is more a framework than a detailed methodology as our aim is to create a deeper understanding of the logical steps that need to be taken and the informed choices that need to be made at each stage. Your trajectory of strategic opportunity is a reflection of what your organisation could do if there were no constraints. It is not a projection into the future – based upon an extrapolation of the past – but a perspective on how the forces shaping your industry are defining a possible future. It is about understanding where the likely discontinuities on this trajectory will come from and the disruptor organisations that are likely to redefine your industry. This is not something that can be easily done from within the organisation. In our view experiential learning journeys are excellent vehicles for understanding how strategic opportunities are developing, particularly when undertaken by a leadership group. Through shared experiences and reflective discussion, participants begin to see the world differently, their perspectives change, new insights are developed and greater shared understanding gained. When leaders think about strategy they think about how their organisation could operate in the future. They are thinking about how the current sources of value could be maximised and where new ones could be created. We call these sources of value the strategic axes of the organisation. Strategic axes not only define what an organisation does, but also the extent to which it does it. For example, all retail banks have a set of strategic axes, one being payments that enable customers to pay bills and transfer money. This strategic axis offers a spectrum of choice and where a bank chooses to position itself on this spectrum defines its strategic intent – something we will discuss further in step 4. 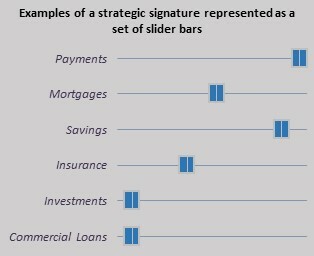 Other strategic axes in retail banking could include: savings, insurance, investments, mortgages and commercial loans. Some strategic axes are well established in an industry, like in the retail banking example above, while others will be created as new sources of value are pursued. For example, when Apple launched iTunes in 1998 it pursued a new source of value, and as a result introduced a new strategic axis to the Apple organisation. Equally, when Amazon was launched in 1994 it operated on one strategic axis, ie e-retailing, initially focusing on books. Over the years it has introduced new strategic axes, including Amazon Web Services in 2002, the e-reader (Kindle) in 2007 and video on-demand (initially called Amazon Unbox and latterly Amazon Prime) in 2006. As discussed above, there are many reasons why an organisation is following a given trajectory. Some, like global economic trends, regulation and market demographics, are external factors that are largely outside management’s control. The majority however are internal and therefore are – in theory – within their control. Examples of organisational capabilities that exist in many organisations include the ability to manage cost; develop new products; deliver customer service; manage processes; innovate; integrate acquisitions; manage vendors; be health and safety compliant; deliver IT services; and develop talent. It is important to remember that the dominant organisational capabilities that exist in your organisation today were developed for a reason: to establish and maintain the trajectory of your then strategy. When it comes to changing your current trajectory it is highly likely that some of your current organisational capabilities will anchor your organisation to its current trajectory, ie your trajectory of strategic reality. 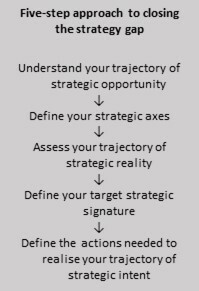 Your chosen set of strategic axes, together with where you choose to position yourself along each of the strategic axes, defines your target strategic signature, and thereby your trajectory of strategic intent. (Incidentally, where you operate today on each strategic axis is your current strategic signature.) Returning to the retail banking example illustrated in the sidebar example, a strategic choice for payments could be to provide a full range of payment facilities available through the branch network, telephone, internet and mobile devices. At the other extreme the choice could be to offer a more limited set of payment services, for example only via the Internet. Most retail banks operate on the same strategic axes, but choose different positions along each spectrum of (strategic) choice. Equally, if a bank provided mortgages the spectrum could range from basic repayment mortgages through to offset mortgages linked to current accounts. In the Apple example previously discussed, the Apple leadership may not have completely understood the full spectrum of choices available to it along its original iTunes strategic axis, but over time it has continually extended the range of this strategic axis and repositioned itself accordingly. Over time it has moved from providing a simple music player to the sophisticated multimedia content manager, hardware synchronisation manager and e-commerce platform of today. Returning to the purpose of step 1 (understand your trajectory of strategic opportunity), it is not only to identify potentially new strategic axes, but to understand how existing ones could be extended in terms of their potential for greater value creation. Its purpose is also to identify those strategic axes that are coming to the end of their time and from which the organisation needs to exit. Defining your target strategic signature is a way of defining your trajectory of strategic intent. Once the trajectory of strategic intent is defined, the focus usually turns to implementation, which usually involves identifying the actions and plans needed to push the present into the future. The ‘push’ approach is predicated on the assumption that successful implementation is achieved through the execution of a series of steps – essentially, implementation of a pre-defined plan, where the completion of each step takes the organisation closer to its target state. An alternative approach – and one we strongly advocate – is to pull the present into the future. The ‘pull’ approach takes a different perspective and aims to create a context where people can exercise their judgement, apply their experience and use their expertise to pull the organisation from the present into its target future. The challenge with the pull approach is that the conditions for change need to be embedded within the organisation in ways that lead to intellectual, emotional and physical engagement. And this can only be achieved if the right context is created – a context where everyone in the organisation can constructively contribute to pulling the present into the future. If however, the target future requires a significant shift in trajectory, and as a consequence the outcomes are less predictable, then the pull approach is more appropriate. Organisations consist of people who think and act based upon their experience, knowledge, beliefs and values. They respond to events in the best way they know how and aim to deliver value in everything that they do. But over time their actions can become habits that collectively determine the trajectory of the organisation – a trajectory taking it to its default future. The role of leaders is to understand this trajectory and decide what choices and actions need to be taken to shift the current trajectory to one that is closer to the trajectory of strategic opportunity. 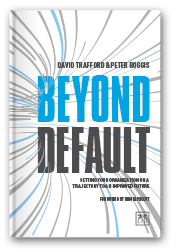 All organisations are on a trajectory to a default future – the place they will end up if they take no action other than those currently planned. The purpose of strategy is to shift this trajectory (of strategic reality) to one that is closer to the trajectory of strategic opportunity. There are two gaps to close, not one. The first gap – between the trajectory of strategic opportunity and trajectory of strategic intent – is closed by developing the ability to understand your trajectory of strategic opportunity and the factors driving it. The second gap – between the trajectory of strategic intent and trajectory of strategic reality – is closed by developing the ability to operationalise strategies. Developing and operationalising strategies are organisational capabilities that most organisations need to develop.